by Bobbi Brinker and S. G. Friedman, Ph.D.
At one time it was thought that there was a third subspecies, P. e. princeps, but this bird is now thought to belong to the nominate species. The Timneh’s natural habitat includes southern Guinea, Liberia, the western region of the Ivory Coast and Sierra Leone. In a beauty contest between Congos and Timnehs there would surely be two winners. Both subspecies have inquisitive black eyes until five or six months of age. At that time a very gradual and variable change in eye color begins including gradations of light gray, yellow-white and yellow. After two or three years, depending on the individual, the final adult color emerges, typically a penetrating shade of pale yellow. 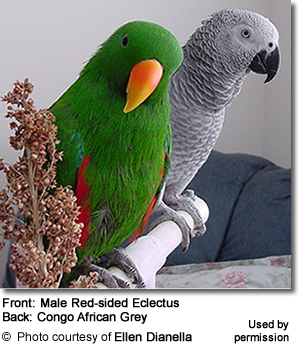 Both Congos (generally about 475 grams) and Timnehs (around 300 grams) qualify as medium sized birds but, as with most characteristics, there are huge variations around the average description. For instance, there are petite Congos and monster Timnehs, but lately there have been a lot more monster Congos. This is most likely a result of improved breeding and nutrition practices of some breeders and owners. Scott Lewis, a breeder from Texas, has a Grey breeding male aptly named Big Boy who weighs well over 600 grams. Len Charette, a breeder from Pennsylvania, recently reported the weight of a 9 ½-week-old baby Grey at 600 grams. It may be time to name a third subspecies after all: P. e. elephanthacus! 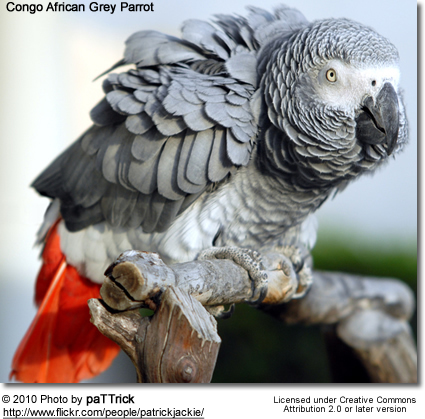 Aside from their smaller size, Timnehs are easily distinguished from Congos by their beak and plumage color. 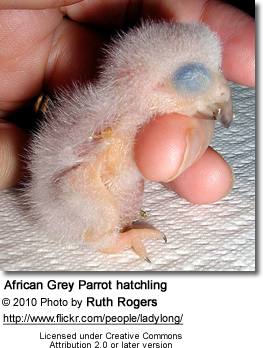 Their beaks gradually change from a solid brownish black to the typical bi-color starting at around ten weeks of age. Adults have peach to reddish upper beaks that are tipped with black. The lower beak (mandible) is black. 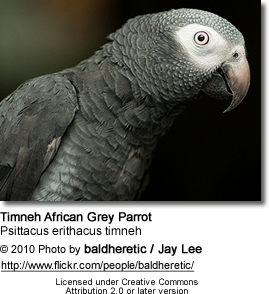 The Timneh’s feathers are generally dark slate gray with a subtle hint of taupe. The abdomen and rump are various shades of light gray with some darker edging. The babies’ tail feathers are typically maroon-brown but can be very dark gray with no hint of maroon, or light gray tinged with the adult shades of dark red wine. Many myths surround this intelligent companion bird. Some of these myths have assumed the status of fact by virtue of repetition, but repetition does not make them true. 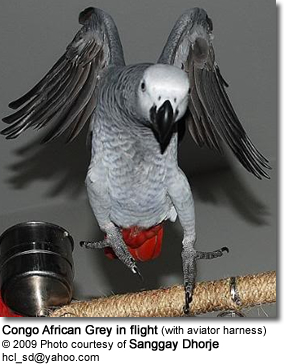 One common myth is that Greys are clumsy birds. Nothing could be farther from the truth. 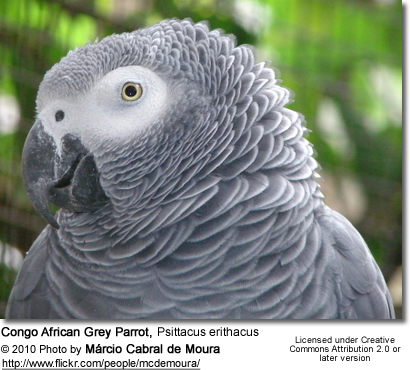 Greys are innately graceful birds in the wild and there is absolutely no reason to believe that this characteristic has disappeared in our domestically bred birds. Clumsiness is typically the result of three common practices: premature trimming of baby birds’ flight feathers; excessive wing trimming; and severe toenail clipping. A favored person should not squander this honored status (even though it does prove this person is the most lovable, trustworthy and humble person in the house…maybe the universe). The favored person bears the primary responsibility for facilitating a happy, secure, well-behaved bird--this includes facilitating rewarding relationships with others in the home. The favored person may need to examine his own motives for wanting a one-person bird if his Grey does not have the confidence to interact politely with other family members. Take special care to investigate the materials used in cages manufactured outside the U.S. where lead is still used in paints because lead is toxic to birds when ingested. Never use a cage (or anything…toys, bells, links) with zinc in the metal or paint because zinc is toxic when certain levels are ingested. Insist that cage manufactures provide detailed information about cage materials. Together, we can make zinc poisoning a threat of the past. Modern inks are non-toxic and will not hurt your bird if ingested. Newspaper is the safest bedding for the bottom of your bird’s cage. The more variety in perching surfaces and sizes the better. The perches, depending on the size of the bird’s foot, should vary from 1½ inches in diameter to approximately 2½ inches. These larger diameters are more comfortable for Greys’ long, slender toes. Favorite foods to offer daily include Bobbi’s Birdie Bread (see below), sprouts or soaked seeds, yellow-orange and dark green vegetables, brown rice, cooked beans and pasta. These foods can be mixed or served separately. Squeezing fresh orange juice over the soft foods will keep them fresh for many hours. Fruits should be considered treat foods because they contain so much sugar. As with all birds, never feed avocado, chocolate, caffeine in any form, alcohol or excess sugar, salt or fat. While we’re in the kitchen, heed this warning: Products with a nonstick coating release PTFE fumes when heated above 530 degrees Fahrenheit or are used for an extended period of time. These fumes are toxic to birds. Non-stick coatings are everywhere including space heaters, irons, ironing board covers, bread machines, ovens and oven racks. Warning - the batter will be hard to mix!! - Mix wet and dry ingredients separately. - Combine wet and dry ingredients along with shredded/chopped veggies. - Spray 9x13 pan with cooking spray and bake about 30 min. in a 400 degree preheated oven. - Cool on rack, cut into squares and freeze in 3 day batches. 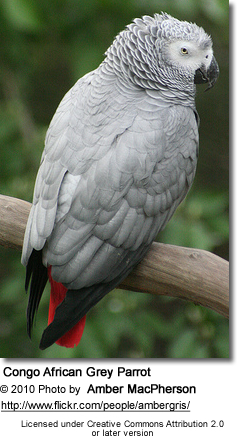 Daily bathing is fundamental to maintaining a healthy African Grey. Unfortunately, people often overlook or underestimate this need. Greys must have frequent opportunities to hydrate their feathers especially during heavy molts and when you are heating or air conditioning your home. Truly, when it comes to bathing, more is better. Most Greys learn to enjoy bath time with consistent, gentle persuasion especially if the breeder has offered baths from a very early age. For older birds, it’s a matter of discovering which method they prefer. Some birds prefer cool water, while others prefer warm. spray misting, showering with a favorite person or placing floating toys, ice cubes or leaves in a shallow pan of water. Some Greys respond to bathing with characteristic caution or utter disgust. As always, do not move faster than your Grey is willing to go. Remain patient, but don’t give up. Similar to children, both quality and quantity time matter when a trusting, loving relationship is the goal. Dicker2 developed an excellent model for managing time with our birds based on three kinds of attention: direct, shared, and ambient. Direct attention is “one to one” time with lots of eye contact and touching and no distractions. Indirect attention is the shared time when you’re playing with the bird but you’re also reading, watching TV or talking on the phone. Ambient attention is when the bird is out of his cage in the midst of the family hubbub. At a minimum, birds need 30 to 45 minutes each day of combined direct and indirect attention, and about 3 hours per day of ambient attention. There are two other important benefits to teaching your birds to respond automatically to the up/down prompt. First, your birds will always have something they can do to please you, something they can do right. This is a powerful strategy for relationship building. No bird needs to be sent to the proverbial “dog house” and no interaction needs to be left unsuccessful when a well-timed “Up” request results in immediate compliance. 1, 2 Dicker, Layne David, Parrots…Parrots…Parrots, 1999 Edition. 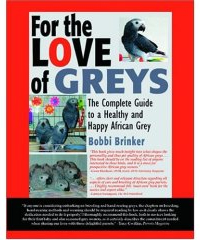 Bobbi Brinker, author of "For the Love of Greys", has been breeding and raising exotic birds for over 10 years. Her empathy for African Grey Parrots evolved into a theory of management based on gentle, unimposing guidance and acceptance. 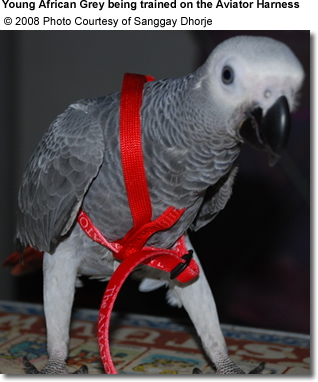 She is committed to ongoing education as the key to improving the lives of companion birds and is the site owner of http://www.ParrotTalk.com, The Grey Connection, and co-owner of Bird911. Her articles are widely distributed nationally and internationally. S. G . Friedman, Ph.D., is a faculty member in the Department of Psychology at Utah State University. Her expertise in the areas of child behavior management, parent training and behavioral research has led her to study and enjoy companion parrots. Her conviction that instruction and behavior change is best accomplished with facilitation rather than force guides her work with companion parrots and children alike.